Mozilla Firefox has always been the first and foremost choice of the internet users. Due to this the development community of Mozilla always try to come up with things that are useful for the users to work with. 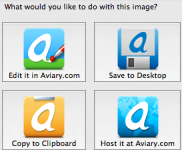 One of the best things about the Mozilla firefox Add-ons is the ease of use. You can have the add-on do whatever browser could do. 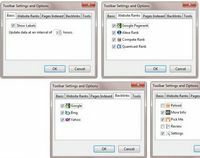 For web designers and developers the amount of time saved and information gathered by these Plugins makes Firefox the programmers best friend. The Web Developer add-on extends Mozilla Firefox by adding a toolbar with various options for working with web pages. It has an option to inspect CSS styles of page elements that will tell you what CSS attributes they have, and which styles affect them. You can inspect & edit CSS on live pages to see if your designs are working or not. It also helps you to disable a lot of scripts, feature which helps in debugging issues. FireFTP is one of the most used FTP client which runs right inside your browser, reduces your time in swapping between your windows while designing web. It offers several advantages to standalone FTP application, such as its operating system-independent requirements. All features that any FTP client must have are included in this plugin. Along with transferring your files quickly and efficiently, FireFTP also includes more advanced features such as: directory comparison, syncing directories while navigating, SFTP, SSL encryption, search/filtering, integrity checks, remote editing, drag & drop, file hashing, and much more! ColorZilla is an another great add-on for Mozilla firefox to check the RGB codes that used in any web page in any section. It lets you select the specific region & tells you its RGB color codes for it so you don’t have to remember it any time. Second best thing you can use it to optimized the advertises within your webpages. You can Zoom the page you are viewing and measure distances between any two points on the page. The built-in palette browser allows choosing colors from pre-defined color sets and saving the most used colors in custom palettes. 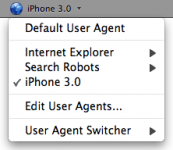 User Agent Switcher is a useful Firefox plugin which able to switch the user agent of the browser. Users can use this tool to pretend themselves to be a search engine and see what search engine sees the webpage. HTML Validator is a Mozilla extension that adds HTML validation inside Firefox and Mozilla. Just as the name of this add-on implies, HTML Validator is all about making sure that your code is up to par. You can also check pages that you are visiting, and thanks to a little indicator in the corner of your browser, you’ll quickly see if the page is in compliance or has errors. Once you click on the indicator you will see a full version of the code that will identify what the problems are. FireShot is a Firefox add-on that creates screenshots of your web page. What is unique about this plugin is that it gives you a set of editing and annotation tools for working with your screenshots. This can be a handy extension to have for presenting your work in your portfolio. 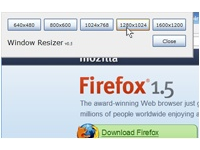 Resize the current page via the Context menu, Tool menu or Toolbar button. You can highlight any keyword of your interest, & then later you can analyse CSS styling information of that keyword. 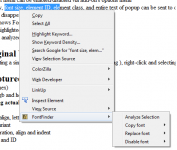 FontFinder is created for designers, developers and typographers. It allows a user to analyze the font information of any element on a page, copy any piece(s) of that information to the clipboard, and perform inline replacements to test new layouts. This addon for quick screen capture is a must-have for bloggers and designers alike! It will perform a screen capture and then open the image INSTANTLY in a basic image editor where you can do markup (draw arrows and rectangles), edit (crop, rotate and resize) and get the exact pixel colors of the image. A perfect companion tool for designers and bloggers! 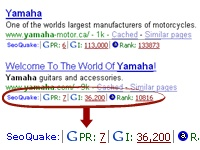 SeoQuake is a programme, which allows user to view a large number of SE parameters on the fly. SeoQuake for Mozilla Firefox consists of three functional parts: SeoToolbar (requested parameters are shown in a separate toolbar in the browser), Seobar (requested parameters are shown in a separate, fully customizable with CSS, HTML block) and output of requested parameters on Search Engine Result Pages (SERPs). 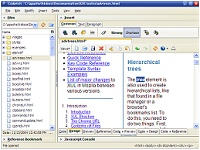 This extenion is GUI Front-end of “about:cache”. 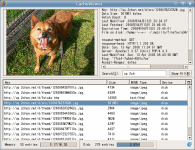 Allows searching and sorting memory and disk cache files. When you open the viewer you get a complete list of the cache. You can search anything you want. 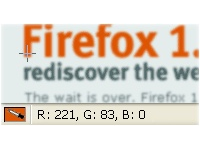 It allows you to sort the items in the Firefox cache by key, size, type and date. Using the Firefox CacheViewer you would be quickly able to find the couple items you need, save them as HTML files and copy the information. This extension will allow you to easily control cookie permissions. 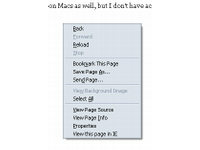 It can be accessed from the statusbar, a toolbar button, or the context menu. 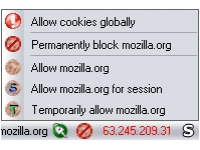 Just click on the icon to allow, block, or temporarily allow the site to set cookies. You can also view, clear or edit the cookies and exceptions by right clicking on the cs lite icon. You can also download a blocklist that contains a list of untrusted hosts that you may choose to import into FF and block. The blocklist can be configured to automatically update or can be updated manually. 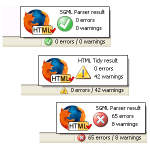 YSlow is a Mozilla or IE web browser utility that analyses the front-end design performance of any web page . This great plugin for mozilla allows ou to optimize your web design on its performance basis like , in what time it loads & what are the different problems with it. 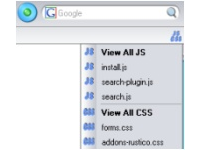 YSlow is integrated with the Firebug web development tool. YSlow grades web page based on one of three predefined ruleset or a user-defined ruleset. It offers suggestions for improving the page’s performance, summarizes the page’s components, displays statistics about the page, and provides tools for performance analysis, including Smush.it™ and JSLint. Total validator is a great validation tool that will check HTML, links, take screenshots and do a many things needed for validating your codes. It also enables accessibility validation (WCAG, US-508), broken link checking, spell checking (in five different languages), and take screen captures via different web browsers and operating systems to find out how your web pages are performing on different browsers & OS. FirePHP enables you to log to your Firebug Console using a simple PHP method call. FirePHP is ideally suited for AJAX development where clean JSON or XML responses are required. All data is sent via a set of X-FirePHP-Data response headers. This means that the debugging data will not interfere with the content on your page. Pixel Perfect works with Firebug to allow developers to overlay composition over their HTML coding to see how many pixels they are off by. You can change the opacity to whatever settings you prefer so you can line up your work as perfectly as possible. Codecatch WYSIWYG Editor FirefoxCodetch is a WYSIWYG editor add-on for Firefox which allows you to edit web pages directly in to the Firefox. The interface is similar to dream weaver & it reduces your time while designing as you do not have to swap everytime between your developer studio & browser. Join the 70-647 online training for developers and designer and learn about different we applications using 640-816 tutorials and 650-568 study guide. These look like great add ons. Some of these will be very beneficial. Thanks! 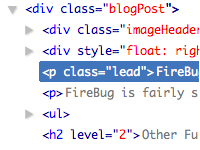 FireBug makes so many things easier it is a true god send! Saves a lot of time on diagnostics etc. Federico is right : “Measure it” add on is really great. I’m working with it every day and I would be lost without it now !